Two long standing gala records were broken at the Specsavers 50m Sprint Gala staged by the Guernsey Amateur Swimming Association. The event saw sprinters from both the Guernsey Swimming Club and the Beau Sejour Barracudas enjoy an afternoon of fast and exciting swimming over a distance of 50 metres in the four swimming disciplines – freestyle, backstroke, breaststroke and butterfly, with swimmers accumulating points to determine the overall trophy winners. In the 16 and over age group, Courtney Butcher gained victory in all 4 events to take best girl award in her age group. 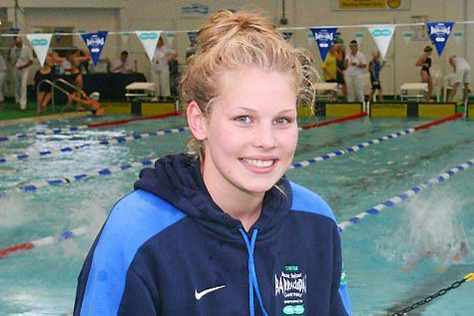 She also smashed the 50m backstroke record set in 2004 by Gail Strobridge by 2 seconds to post 30.42. Courtney then went on to take the 50m freestyle record set in 1999 by the infamous Helen Watts, to set a new mark of 27.15. Also scoring maximum points of 24 by winning all four events in their respective age groups was Tom Stapley in the 13 year age band and Sophie de la Mare for the 14 year olds – both youngsters showing gritty determination to take top spot. Ben Lowndes (16 and over) Will Russell (15 years) Elliott Lock and Laura Le Cras both 12 years and Ailish Rabey (11 years) each won their age groups scoring 23 points, just one shy of maximum. 9 year old Ebony Lowndes, followed in her dad’s footsteps by winning her age group – 9 years with a score of 19 points. The equivalent boy’s title went to Jack Dowinton with a great total of 21 points. The 10 year age group saw some promising swims from Oriana Wheeler, who placed first overall with 20.5 points while team mate Xander Graham took the boys award with a well-earned 21 points. There was a tie for first place in the 11 year old boys section with John Welbourne and Samuel Lowe both finishing on 21. The 13 years girl’s title went to Millie Wenlock on 22 points and Louis Tostevin won the 14 year boys award with 20 points.